AG GP Ltd. and USA based AVAIGEN Inc. have signed a contract on Supply and Distribution of Indian River Grand Parent stock and Trade Mark License at Ahsan Group head office, Mohakhali on 14 th November 2016. 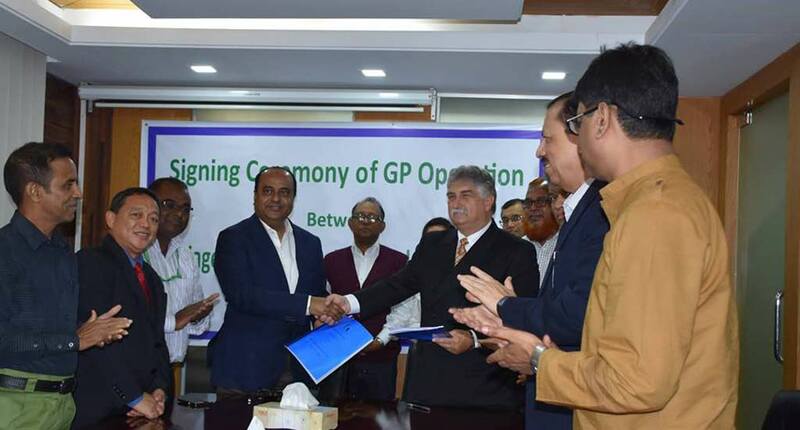 As per this contract in upcoming days AG GP ltd. will produce Parent Stock of Indian River Brand..
Mr. Shahidul Hasan Chairman of Ahsan Group and W.R. Bill Souther Senior Vice President, Asia Pacific of Aviagen signed the contract. From AVAIGEN ESMI B. San Pedro, DVM, Technical Service Manager, Dr. M M Khan representative for Bangladesh , Md. SHahid Al Mehedi and CEO of AG GP Ltd. KDB Mr. Md. Lutfor Rahman, CFO Mr. Mahbubur Rahman, Jabed Bhuiyan, GM Breeder Operation, Nurul Alam, GM Sales &amp; Marketing were also present at signing ceremony.